​Our operating hours for each location changes with the seasons. Check back for new hours in Winter, Spring, Summer and Fall. Happy planting!! Walton's Greenhouse, Growing for You! Walton's Greenhouse has four retail locations and ready to aide you in your gardening adventures. We even have an extra buildings sales site, in Batesville, that is in addition to those located at our four garden centers. For over twenty-five years we have prided ourselves in locally growing bedding plants, vegetables, perennials, grasses, hanging baskets, container plants, succulents, herbs and water plants. We, also, carry tropicals, palms, roses, vines, fruit trees, landscape trees, shade trees and shrubs. If we don't have it; put your name on our "Wish List". We will find it for you. Our experienced staff are ready to assist you in attaining the yard you've been wishing for or just to make your thumb a 'little greener'. Take advantage of our Plant Program using VPG Products that will get you off to a great start or tackle those pesky problems. For the avid gardener or just the beginner; we have everything you need to get the job started and everything you need to get it finished. 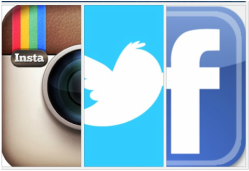 Visit us at our four retail locations in Fulton, Amory, Tupelo and New Albany, MS. Let us get you started today. We are growing for you! Derksen Buildings-Top Quality, Built in Mississippi, Best Prices! Walton's Greenhouse is proud to be a DERKSEN Portable Building Retailer. Our old location in Fulton is home to a display of ready to purchase portable buildings. Visit our Tupelo location (next to Room to Room on Cliff Gookin Blvd), Amory on HWY 278E, and in New Albany on West Bankhead St. Click the picture on the left to carry you to an online brochure of our buildings. Derksen prides itself in QUALITY MATERIAL, QUALITY CONSTRUCTION and QUALITY WORKMANSHIP built by skilled craftsmen. We offer many different shapes, sizes and color schemes. Custom building is available to suit your needs. For on lot purchase of a building, it takes one to two weeks for delivery. If delivered from Derksen plant, allow two to three weeks for delivery. To purchase your storage building today, we offer many payment options, such as; cash, check, credit card or Rent-To-Own. If Rent-To-Own is your option, all that is required is to fill out an application and first months rent payment. GUARANTEED APPROVAL with NO CREDIT CHECK. If at any time you wish to stop using your building, call the rental company and have them pick it up and you owe nothing further with no strings attached. Come and pick out your new building today. We also have a select number of used buildings. (For businesses all rental payments are tax deductible.) 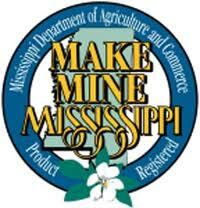 MADE IN MISSISSIPPI PRODUCT. 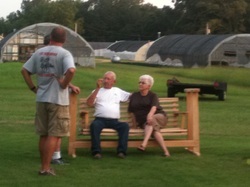 To fill out an application visit Walton's Greenhouse in Fulton, Tupelo, Amory or New Albany . Call 662-862-3399 for more information. Outside of normal business hours you may call 662-231-7616 for Marty. We look forward to spring every year. It is our favorite time. Flowers emerge, warmth returns and the outdoors is home. We are more than ready for sunshine and spring time of 2019 at Walton's Greenhouse. Our Tupelo location has expanded to include a gift shop, pots and fountains. New shrubbery, clematis, peonies, roses, annuals, perennial and trees fill our space with color and contrast. Our garden center employees have had training in the right products to help your planting adventures succeed. Each employee has brought something special to the table this year. Come let them share their talents with you when building your landscape or garden. Fulton is somewhat of our home base. This is where we live and our children grow. Our retail establishment here is sometimes the most recognized. You will see old and new faces there this year. Each with years of experience in all things plant. New plants, new shrubs, new trees and many of your ole trusted Walton favorites. Come and join the fun in the sun. In Amory, we are approaching our fourth spring and our customer loyalty has grown. We are enjoying sharing all things here in this great town. We are opened year round to meet everyone's gardening expectations. Many customers have asked us to expand to bring Walton's plants closer to them. Our newest location is in the town of NEW ALBANY, MISSISSIPPI. New Albany offers all the things you have come to love about Walton's. We are currently a year round operation in New Albany. Our team there is also outstanding in plants! Our farm location in Peaceful Valley is no longer open to the public. We have been blessed with growth and we can no longer adequately attend to your needs as a customer. Walton's is proud to continue to serve you at our four retail locations where, "We're growing for you!" Happy planting. Can't get much closer to home. Lathen Walton and son, Marty Walton, started Walton Greenhouses (currently DBA Walton's Greenhouse) over twenty years ago with one small greenhouse in the rural community of Peaceful Valley in Itawamba County. The greenhouse was literally in Lathen and his wife, Jerry's, backyard. Since 1991 the operation has grown to include seventeen greenhouses at the farm and four at the four retail garden center locations. Once a wholesale only company, Walton's branched into an all retail world in 1997 at Tupelo, MS. Then in 2000 the Walton's opened a second retail location in Fulton. In 2011 Fulton was moved just across the street and received a huge face lift. As the grower and retailer, the plants are looked after each day by Lathen and Marty. In Spring of 2011 Marty's role in Walton's changed, he become a full time partner. He retired, after 26 years of full time service in the Mississippi National Guard. Lathen, a retired agriculture teacher of 31 years, and his wife, Jerry Walton, have been full time in the operation for many years. Marty's wife, Becky, began a full time career with the business in 2014. On the farm, the growing operation is a key factor in the quality of our plants. There are a number of full time employees that tackle growing at the Walton's farm. At the retail locations, much of the staff have been with the operation for years and their knowledge is extensive. Walton's believe they are continually blessed with a team of great people. They, also, believe the Lord gets all the credit and is continually blessed in many ways. 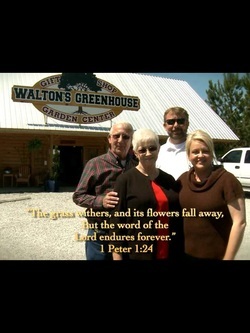 The owners of Walton's Greenhouse are thankful to the Lord, their employees and their VALUED CUSTOMERS. We're growing for you! Checks, Debit and Credit Cards accepted at all retail locations. Not available at farm location.